A new Chinese anti-satellite (ASAT) test could showcase an ability to reach medium-Earth orbit. Doing so, some analysts say, would underscore that country’s ability to place the constellation of U.S. 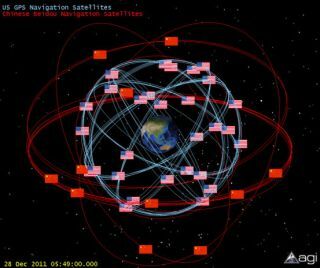 Global Positioning System navigational satellites at risk, but also a similar Chinese system. Reports that China may be on the verge of carrying out another anti-satellite test soon are ringing alarm bells among U.S. space policy and military analysts. That “strong possibility” was noted by Gregory Kulacki, senior analyst and China project manager for the Union of Concerned Scientists Global Security Program, in a Jan. 4 posting on the UCS website blog, All Things Nuclear - Insights on Science and Security. “It is not clear what kind of test may be planned, if indeed one is in the works,” Kulacki wrote. Kulacki flagged the fact that, for several months, rumors have been circulating within the United States defense and intelligence communities that a Chinese anti-satellite test is imminent. It might be conducted on Jan. 11, the date on which China performed ASAT operations in both 2007 and 2010. “Our hope is that getting this out in the open can facilitate a meaningful bilateral dialogue on space security, or, at the very least, get the Obama administration to explain why it refuses to talk to the Chinese about their plans to test,” Kulacki told SPACE.com. “I think the reaction to the next one, whenever it is, will depend on what type of target (low-Earth orbit, medium-Earth orbit — e.g. Global Positioning System satellites) it threatens and whether it is conducted to avoid creating long-lived debris,” Smith said. Smith said she continues to believe that China’s space activities are aimed more at regional than global leadership. “Other countries in the region may react quite differently than the U.S., especially since they just experienced the North Korean missile/satellite launch,” Smith said. “It is easy to imagine they would view this as an escalation of militaristic ambitions in space and a potential catalyst to development of their own ASAT capabilities,” Smith said. Adding his voice to the discussion is James Clay Moltz, a national security affairs associate at the Naval Postgraduate School in Monterey, Calif.
“It seems that China's military and political/scientific/commercial bodies have been at odds since 2007 about defining appropriate uses of space," Moltz said. “If the intelligence communities have any real sense that the Chinese are thinking of testing an ASAT again, the U.S. ought to do everything it can to discourage them from doing so,” said Joan Johnson-Freese, a national security affairs professor at the U.S. Naval War College in Newport, R.I.
Johnson-Freese told SPACE.com that Kulacki’s Internet posting points out several key elements, noting that the opinions she is expressing are her own and do not reflect the views of the U.S. government, the Department of the Navy, or the Naval War College. China — and all other countries — have become acutely aware of the dangers of space debris, especially since the reckless 2007 Chinese test, Johnson-Freese said. Johnson-Freese pointed out that China is weighing its options with regard to potentially signing a space Code of Conduct in the future, which would demonstrate that China is ready to be a responsible member of the family of spacefaring nations. “An ASAT test that created more space debris would certainly go against their professed desire to be considered as such a responsible nation,” Johnson-Freese said. “As long as Congress continues to block bilateral discussions between the U.S.-China on potential civilian space-cooperation projects, the likelihood of much needed U.S.-China discussions on space security issues will be small, or nonexistent. The counterproductive nature of those congressional bans should be reconsidered for a variety of geostrategic reasons,” Johnson-Freese said. Also reacting to the possibility of a Chinese ASAT test is Michael Krepon, co-founder of the Washington, D.C.-based Stimson Center and director of the South Asia and Space Security programs. Krepon’s work on space security centers on the promotion of a Code of Conduct for spacefaring nations. “A number of states, including China, the United States and India, have employed ballistic missile defense tests to become smarter about ASAT applications,” Krepon told SPACE.com. “Additional tests of this nature that do not have long-lasting debris consequences would be unwelcome, but not surprising. These tests would serve to ratchet up ASAT capabilities elsewhere,” he said. A second test of this kind by the People’s Liberation Army “would demonstrate that the Chinese leadership has learned nothing from the first one,” Krepon concluded. Leonard David has been reporting on the space industry for more than five decades. He is former director of research for the National Commission on Space and a past editor-in-chief of the National Space Society's Ad Astra and Space World magazines. He has written for SPACE.com since 1999.